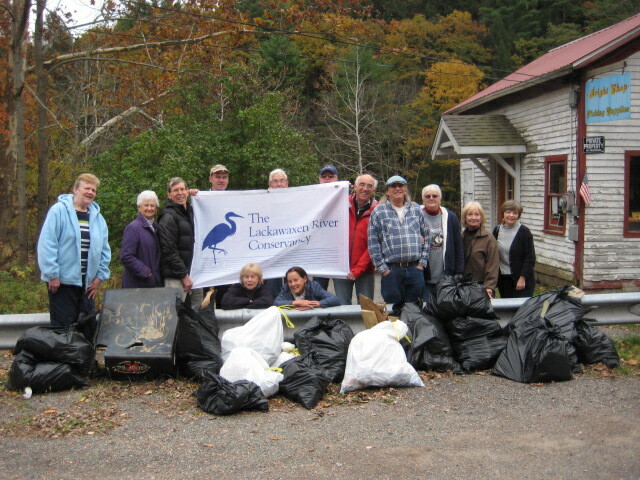 Under a brilliant autumn sky, on Saturday morning, October 22, members of The Lackawaxen River Conservancy, Bernt Balchen Lodge (Sons of Norway) and Men of Bethel gathered at Mt. Moriah cemetery at Kimbles for their annual fall trash pick-up under the PennDOT Adopt-a-Highway Program. Scouring most of a ten-mile stretch of the scenic Towpath between Kimbles and Rowland, they enjoyed the crystalline autumn air and the vibrant colors of fall as they collected close to twenty bags of trash–comprised mostly of beer cans of various vintages, tattered plastic bags, fast-food containers as well as discarded construction materials. Afterward they posed for a photograph at Bright’s fishing supply shop and celebrated their good work with a lunch at the Rowland Café.